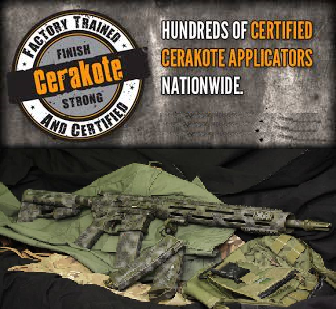 Effective 18 March 2018, our Cerakote Services are on hold. Our cerakote applicator was activated for an upcoming deployment. We will remove this notice when we are back up and running. These are a few example Cerakote prices. If you are two-toning your firearm, we do NOT charge extra…it’s treated the same as single color. 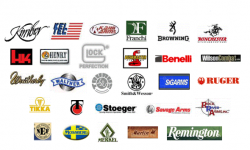 For example: One might Cerakote the slide of a pistol FDE, and the frame Coyote Brown. Camo patterns will usually need to be quoted due to their complexity, color and detail. Turnaround time is approximately 2-3 weeks. If ordering a custom (non standard) color that is not currently in stock, please allow one extra week for delivery of the custom color. Always keep in mind that disassembly/assembly gunsmithingcharges MAY be extra on SOME firearms, depending on the complexity of the internal parts and/or difficulty of removing sights. Due to their design, Glocks and similar pistols usually do not require extra charges for disassembly/reassembly. Berettas, etc., on the other hand, would require extra charges identified below. Bladed Tools / Oakley Sunglasses / Miscellaneous Stuff Email For Pricing!!! !